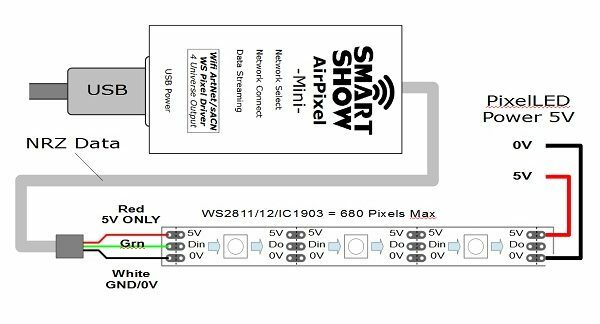 AirPixel-Mini is a Wifi ArtNet/sACN(E1.31) to WS2811/12 (NRZ) and IC/USC1903 Driver interface. It is capable of receiving up to 4 DMX universes of up to 512 channels per universe. The data is then converted into a continuous NRZ data stream that will appear on the JST output connection. Network connection can be made by utilising a special Access-Point Mode. 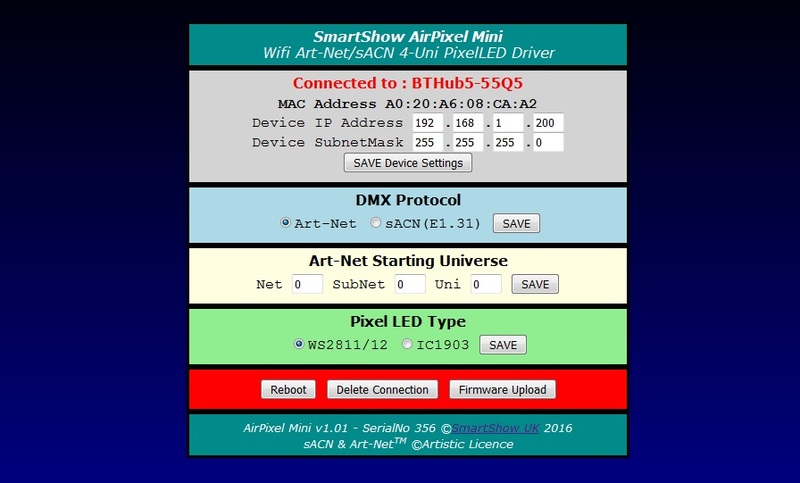 Device IP, ArtNet/sACN, and LED Settings are adjustable directly from a second browser interface once the Wireless Network Connection has been made. Product Firmware updates can be sent over-the-air, and a serial configuration & diagnostics interface has also been included.